When Schiller visited Tuebingen, he also met his publisher Friedrich Cotta, a young man of 30 years of age, for the first time. The latter had taken over the “family business”, in existence since 1659, in the year 1787. The second meeting between Schiller and Cotta took place in May of that year (in Stuttgart). During a long walk, they discussed Cotta’s idea of a political newspaper, the editorship of which Schiller was possibly to take on (the newspaper in question was the “Allgemeine Zeitung”, which Cotta founded later, namely in 1798 and one of the “collaborators” of which would later, in 1831, be the German writer Heinrich Heine. However, Cotta and Schiller also discussed the latter’s plan of a “literary” periodical, the “Horen”, which then “had its lifetime” from 1795 to 1797. During his stay in Wuerttemberg and after his “return” there to Stuttgart in mid-March, Schiller met some of his former fellow students from the Karlsschule, as, for example, the sculptor Johann Heinrich Dannecker and the painter Philipp Friedrich Hetsch. After Schiller had returned to Jena, he, Wilhelm von Humboldt and Fichte prepared an invitation to the participation in the “Horen” magazine. “Mit Freuden nehme ich Ihre guetige Einladung nach Weimar an, doch mit der ernstlichen Bitte, dass Sie in keinem einzigen Stueck Ihrer haeuslichen Ordnung auf mich rechnen moegen, denn leider noetigen mcih meine Kraempfe gewoehnlich, den ganzen Morgen dem Schlaf zu widmen, weil sie mir des Nachts keine Ruhe lassen, und ueberhaupt wird es mir nie so gut, auch den Tag ueber auf eine bestimmte Stunde sicher zaehlen zu duerfen. Sie werden mir also erlauben, mich in Ihrem Hause als einen voellig Fremden zu betrachten, auf den nicht geachtet wird, und dadurch, dass ich mich ganz isoliere, der Verlegenheit zu entgehen, jemand anderes von meinem Befinden abhaengen zu lassen. Die Ordnung, die jedem andern Menschen wohl macht, ist mein geaehrlichster Feind, denn ich darf nur in einer bestimmten Zeit etwas Bestimmtes vornehmen muessen, so bin ich sicher, dass er mir nicht moeglich sein wird. “With pleasure I am accepting your invitation to Weimar, but with my serious request that you, in no way, count on me and my actual presence in any of your household’s activities, for my cramps usually force me to sleep all morning, since they invariably trouble me during the night, and I never feel that well that I can count on my total well-being for any hour of the day. You will thus allow me to have you consider me as a complete stranger in your household who nobody pays any attention to and by my isolating myself I save myself from the embarrassment to have someone else depend on my state of health. The order and regularity which is so good and sensible for everybody else is my most dangerous enemy, for I only have to plan something for a certain time, and I can rest assured that I will not be able to follow through with it. In their discussions, Goethe and Schiller found that their views with respect to art and theories on art were very much alike in many respects, so that Schiller’s sequence of letters “Ueber die aesthetische Erziehung des Menschen” (on the esthetic education of man) found Goethe’s approval, and in return, Goethe sent Schiller his essay, “Inwiefern die Idee: Schoenheit und Vollkommenheit mit Freiheit, auf organische Naturen angewendet werden koenne” (As to how far the idea, beauty and perfection (combined) with freedom, can be applied to organic, natural phenomena). Schiller also suggested that Goethe publish his “Wilhelm Meister” in sequels in the periodical “Horen”, but Goethe had to decline. Goethe was also increasingly fascinated by the scientific institutions at Jena, so that he spent some time there in November of that year, and in Schiller’s house he also met a young German poet, Friedrich Hoelderlin. Howeve, Goethe could not appreciate this young man as much as Schiller did. Schiller’s and Goethe’s lively discourse with respect to Wilhelm Meisters Lehrjahre was to, from then on, accompany the writing process of this work, and Schiller’s letters became so important to Goethe that he saw in them an encouragement to carry on with his writings on this work. The new “Horen” which was published by Cotta on January 15th, 1795, contained Schiller’s new version of his letters to the Duke of Augustenburg,On the Esthetic Education of Man, in a Series of Letters(Letters 1-9), and the continuation of those letters (10-16) was contained in the February issue. Due to Schiller’s encouragement, Goethe worked on his Wilhelm Meisters Lehrjahreall year and was able to complete volumes four, five and six. Goethe was also very much involved with the “Horen”, which featured his essay, Literarischer Sansculottismus(Literary Sansculottism), a polemic against the literary critic Daniel Jenisch, but without mentioning the latter’s name, his Unterhaltungen deutscher Ausgewanderten(Conversations of German Emigrants), and his translation of Mme. De Stael’s Essai sur les fictions(Essay on Fiction), but also reviews such as on Johann Jakob Engel’s novel Herr Lorenz Stark, ein Charaktergemaelde(Mr. Lorenz Stark, a Character Portrait). Schiller’s publications of that year in the “Horen” also included his poems Das Reich der Schatten, the later title of which would be Das Ideal und das Leben, Natur und Schule, later published under the title Der Genius, Das verschleierte Bild zu Sais, Elegie which, from 1800 on, was entitled Der Spaziergang, while the “Musenalmanach fuer das Jahr 1796” contained, amongst other items, the poem Wuerde der Frauen which, in the circle of the Schlegel brothers, was received with laughter and which was parodied. The November issue of the “Horen” contained Schiller’s essay Ueber das Naïve and in December, amongst other items, its continuation, Die sentimentalischen Dichter. The “Horen”, in spite of the high quality of its articles, was criticized and ridiculed by literary critics, above all the one whom Goethe had criticized in his essay on “literary sansculottism”. Goethe reacted by suggesting that such occurrences should also be discussed in the “Horen”, but this plan was deferred and it was decided to feature such rebuttals in other publications. For this “project”, Schiller and Goethe became inspired by the ancient Roman writer Martial who, in the first century of our times, wrote short epigrams and ironically called them Xenia(Gifts by Guests), and they adopt Martials form, briefness and satirical spiciness, so that, by December, the first of nearly thousand Xenien had been written by Goethe and Schiller in collaboration. General human foibles, problems of the times, and particular individuals were thus attacked in them. In February of this year, Goethe had begun to translate the autibiography of Benvenuto Cellini, while Heinrich Meier was in Italy and sent him materials for his studies from there. Goethe in turn, for Schiller’s “Horen”, wrote the Briefe einer Reise nach dem Gotthard(Letters from a Journey to the Gottard) which were based on his original letters from his journey to Switzerland in the year 1776 with the Duke of Weimar. In this year, Goethe also attempted to win the former Mannheim actor Iffland for the weimar theatre. Iffland, however, became director of the Berlin National Theatre. In May of that year, Goethe met August Wilhelm Schlegel who had, already in January, reviewed the poetical content of the “Horen” in January in the “Allgemeinen Liteatur-Zeitung”. Hegels critique of the “Horen” and of the “Musen-Almanach” led to a cooling of any heretofore existing “considerations” between Schlegel and Schiller, while Goethe kept in lively contact with both Schlegel brothers. With respect to the Literary Declaration of War between Goethe, but more particularly Schiller, on the one hand, and, for example, August Wilhelm Schlegel, on the other hand, gained its sharpness also out of Schiller’s personal character which, by this time, had taken on certain “dictatorial” traits. Even Goethe had to, once in a while, “save himself” from Schiller’s stubbornness, which was also coupled with an extraordinary degree of sensitivity. Hoever, one may wish to ask oneself as to whether these traits were not also “aggravated” by Schiller’s health situation, let alone by his ambitions to see his ideas, as they were expressed in his essays, “turn into reality” in one way or another, thus to see that his work had “any influence”. The writer is becoming aware of the fact that we present quite an array of data of the cooperation between Goethe and Schiller here. Since, however, this level of cooperation between the two was so intense during this year, we have to carry on and describe some more areas of it. During the months of May and June, Schiller and Goethe also discussed the literary genre of the ballad. Subsequently, Goethe wrote five ballads which were published in Schiller’s Musenalmanach fuer das Jahr 1798, namely Der Schatzgraeber, Legende (Belehrung des Petrus ueber den Wert des scheinbar Nichtigen), Die Braut von Korinth, Der Bott und die Bajadere and Der Zauberlehrling. Schiller adapted Goethe’s ballad idea of Die Kraniche des Ibycus and further wrote the ballads Der Taucher, Der Ring des Polykrates, Der Handschuh and Der Gang nach dem Eisenhammer. It should also be mentioned that Schiller had already encouraged Goethe in the year before to continue with his Faust, which Goethe took up writing on again in June of 1797. Schiller will later be able to profit from Goethe’s journey to Switzerland of this year, for Goethe, inspired by his wanderings through the area in which William Tell lived, initially wanted to write an epic poem about the liberation of Switzerland. Abandoning the idea, he was able to pass much of his background information on to Schiller who would make use of it in his play William Tell. In this year, Schiller’s collaboration with Goethe continued. When Schiller was Goethe’s guest in Weimar from mid-September on, Goethe suggested that Schiller should divide his play Wallenstein into two parts, of which Wallensteins Lager (originally a prologue) was supposed to be staged for the re-opening of the Weimar theater (which underwent re-construction during the months of July to September of this year). Based on this suggestion, Schiller began to work on a rearrangement of the old prologue, so that the entire work could ultimately be presented in three parts. The Schiller ballads that were published in the Musenalmanach auf das Jahr 1799 were Der Kampf mit dem Drachen and Die Buergschaft. Schiller also actively participated in Goethe’s art magazine, Propylaen which contained some of Goethe’s most important essays. Goethe and Schiller also developed a novella entitled Der Sammler und die Seinigen, which was a work in letter and dialogue form and which was completed in 1799. Once the Schillers had resolved in August of that year to keep, in addition to their Jena apartment, also an apartment in Weimar, Duke Karl granted Schiller’s petition for an increased salary; the 200 thalers annual salary that had been paid to Schiller since 1790 was doubled. Schiller’s income was also augmented by Iffland’s sending him 60 Louisdor for the rights to stage his play Wallenstein in Berlin and the 150 thalers for the staging of Wallenstein in Lauchstaedt. Muss die Form in Stuecken gehen. Its shell has to break. Das gluehnde Erz sich selbst befreit! The glowing iron-ore seeks its own freedom! We are well-advised to take into consideration here that Schiller had, by now, certainly ‘moved beyond’ some of the more ‘revolutionary’ content of his Ode to Joy. This maturing process also reflects Schiller’s earlier recanting of the French Revolution and of its effects. In this year, Schiller and Goethe were also involved in forming, with Heinrich Meyer, the circle of Weimarer Kunstfreunde (Weimar Friends of the Arts) which was also to engage in holding contests for artists. In May of that year, the first contest was announced in the Goethe’s art magazine Propylaen which occurred under the motto, Venus fuehrt Paris Helena zu (Venus leads Paris to Helena). During the summer months, the Weimarer Kunstfreunde dealt with dilettantism in art. The winners of the contest were the painters Friedrich Harmann and Heinrich Christoph Kolbe. It can also be reported that Schiller worked on Shakespeare’s Macbeth in the latter part of the year. Schiller’s and Goethe’s ‘art project’, the Weimarer Kunstfreunde saw the publication in the February issue of the Propylaen this year’s contest topics, Hectors Abschied von Andromache (Hector’s farewell from Andromache) and Raub der Pferde des Rhesus (The Theft of Rhesus’ Horses). Among the submissions was also Clemens von Brentano’s comedy Ponce de Leon which did, however, not win a prize. This name may ‘ring a bell’ with Beethoven friends. Clemens Brentano was, of course, the brother-in-law of the composer's friend Antonie Brentano and the half-brother of her husband Franz Brentano. With respect to the soon sold-out first edition of the Wallenstein-Trilogy should be mentioned that new editions followed immediately, also in subsequent years. With respect to Schiller’s working on his play Die Jungfrau von Orleans can be reported that Goethe approved of it. The Duke of Weimar, however, did not want to see it staged in Weimar. The ‘official’ reason for this was that the audience would have expected a treatment of this topic in the style of Voltaire’s Pucelle and that it would be disappointed by Schiller’s very different ‘take’ on the subject. A more ‘practical’, yet also ‘delicate’ reason may have been the fact that the lead role would have had to be played by the actress Karoline Jagemann, whose close ties to the Duke were very well-known. For her to play a ‘virgin’ would have raised some rather unwelcome criticism and ridicule. With respect to his work on his Wilhelm Tell, Schiller requested of his Tuebingen publisher Cotta a special map of Lake Vierwaldstaetten and environs. With respect to the death of Schiller’s mother in Cleversulzbach, Schiller had his inheritance interests represented by Cotta. Earlier, he had waived his inheritance rights in that respect in favor of his mother, on the 1796 death of his father. Schiller’s literary work of that year concentrated on his development of the tragedy Die Braut von Messina (The Bride of Messina), the beginnings of which go back as far as 1797. With this work, Schiller meant to ‘revive’ Greek tragedy, particularly by using choruses. As he wrote in his essay Ueber den Gebrauch der Tragoedie (On the Use of Tragedy), he wanted to transform the common modern world back into the poetic, classical world. "Der Mensch und der Deutsche besonders, bildet sich seine Welt, und was keine Bildung annimmt, lernt er ertragen. Es ist jetzt ein so klaeglicher Zustand in der ganzen Poesie, der Deutschen und der Auslaender, dass alle Liebe und aller Glaube dazu gehoert, um noch an ein Weiterstreben zu denken und auf eine bessere Zeit zu hoffen. An ein Zusammenhalten zu einem guten Zweck ist nicht zu denken, jeder steht fuer sich und muss sich seiner Haut im Naturstande wehren. Goethe ist jetzt ordentlich zu einem Moench geworden und lebt in einer blossen Beschaulichkeit, die zwar keine abgezogene ist, aber doch nicht nach aussen produktiv wirkt. Allein kann ich nichts machen, oft treibt es mich, mich in der Welt nach einem anderen Wohnort und Wirkungskreis umzusehen; wenn es nur irgendwo leidlich waere, ginge ich fort." "Man, and the German in particular, forms his own world, and what cannot be shaped he learns to bear. It is such a pitiful plight with all of poetry, with that of the Germans and that of foreigners, so that all love and all faith would have to be summoned in order to even consider a moving forward and a hoping for better times. One cannot even think of any cooperation for a good purpose, everyone is isolated, by himself and has to fend for himself in a state of ‘raw nature’. Goethe has turned into a veritable monk and lives in utter contemplation, which is not an isolated one, yet he is not outwardly productive. I cannot do anything by myself, and often I feel urged to look for another place to live and work in; if there was such a place anywhere, I would leave here." It appears that in the year 1804, Goethe’s and Schiller’s cooperation had improved somewhat. 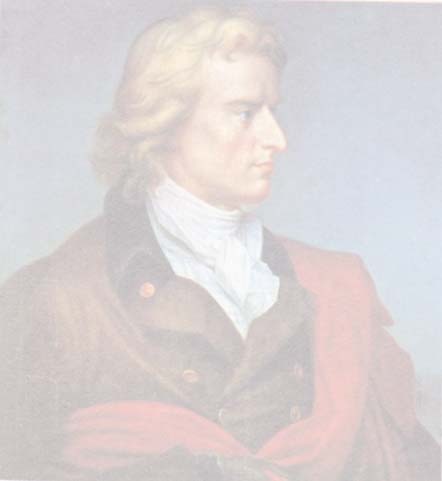 With respect to Schiller’s receiving an offer by Queen Luise of Prussia to move to Berlin, Schiller wrote to the Duke of Weimar and asked for an increase of his salary, which was then doubled from 400 to 800 thalers. "Ich werde Muehe haben, die harten Stoesse seit neun Monaten zu verwinden, und ich fuerchte, dass noch etwas davon zurueckbleibt . . . Indessen will ich mich ganz zufriedengeben, wenn mir nur Leben und leidliche Gesundheit bis zum 50. Jahr aushaelt." "I shall have difficulties in overcoming the hard blows of the last nine months and am afraid that some after-effect will remain . . . All the while, I shall be quite content if I can continue to live in tolerable health in order to reach the age of 50 years." Goethe, who was in ill health himself, was, at first, not told of Schiller’s death. A forensic study of Schiller’s remains resulted in the following report as to the cause of death: acute pneumonia with progressed destruction of the left lung, deformation of the heart muscle and a blockage in the intestines. On May 12th, parts of Mozart’s Requiem were performed at a funeral service. With Schiller’s death, the ‘high period’ of ‘classical’ German literature came to an end, with Goethe fending mostly for himself in his own late works.